Account vs subscription: what’s the difference? Team subscriptions are equipped with an Admin Center for managing users, central billing, policies and custom branding. To access your Admin Center, head to Web Access and switch view. There are three types of roles in a team subscription. Owners can manage users, policies, billing and change settings. Co-admins can manage users and policies. Users can’t modify subscription details. 📚Let’s clear things up — subscription roles differ from access permissions. Roles define which users can modify and see subscription details. Permissions, however, are different for each tresor, defining whether members can modify, delete, or-re-share files in that particular tresor. Therefore, every user has several tresor access permissions but only one subscription role. Admin Centers are equipped with a dashboard to give an overview of what’s happening in your account. Here you can read and export activity reports and oversee the most important user statistics. Through the Admin Center, you can view and manage users one-by-one or in batches. Admins and co-admins can control tresor access, unlink devices, suspend users, or remove them entirely from the subscription. Subscription Owners can reset forgotten passwords and revoke access to Tresorit files on lost or stolen devices. After switching Advanced Control on, users in your subscription will receive a request to accept changes. You can find this feature under settings. Policies are sets of security measures varying by user groups. Users in one group will have the same set of privileges. A user can only belong to one template. Each team is unique — create your own templates to customize settings for different teams and departments. Customize the look and feel of Tresorit for your organization: add your company’s logo and change colors to match with your brand guidelines. You can find this feature under settings. The Admin Center is a feature accessible for admins in Small Business, Business and Enterprise plans to help you keep track of what’s happening in your company subscription. 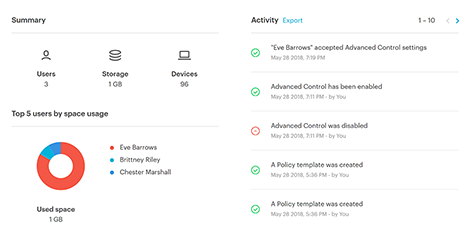 With this feature, you can monitor device and user statistics, define security policies and customize the design of your Tresorit workspace with your brand visuals.